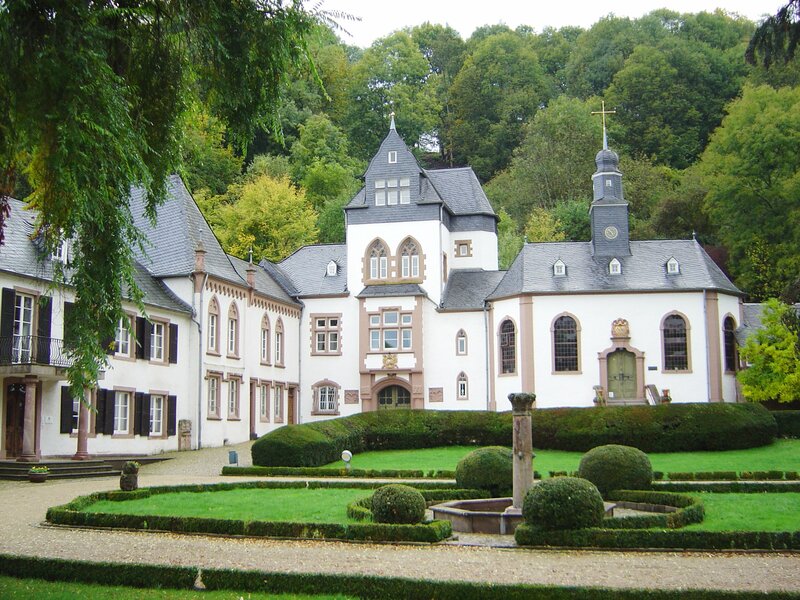 Somewhere in a remote but picturesque location in southern Germany, there’s a special castle called Schloss Dagstuhl. Every week, the castle fills up with a smallish group of Exceptionally Privileged Computer Scientists, who can only go there Because They Have Been Invited. Every week hosts a different field; In my case this was the Scientific Visualization seminar, one of the oldest participating groups. Everything has been setup just so to guarantee a perfect computer sciencey week for all guests. Because I’ve already been boring too many people with this story in person, I thought it prudent to write it up. Let’s hope it’s not a first (and second!) rule of Fight Club situation, in which case posting frequency over here might drop quite drastically. Schloss Dagstuhl, picture courtesy of Wikipedia. To begin with, the meals are exquisite, three times a day, every day. As we all know, the path to a computer scientist’s heart is through buying them new gadgets, but feeding them well is a great backup plan. Another very nice touch is the fact that seating is deliberately randomised, meaning that your introvert self is forced to sit at the table with a different group of guests during each lunch and dinner, in turn meaning that even if you try otherwise, you will probably get to have a good conversation with every one of the fifty attendees. In the case of our seminar, the working day consists of presentations in blocks of three or four, followed by a longer block of discussion on all the preceding presentations, panel style. Attendees were all asked not just to give a standard scientific presentation, but to discuss open problems and future challenges in their respective sub-fields. I (and many others, judging by the aggregated post-meeting feedback) really enjoyed this format. The presentations made one think, and the discussion blocks were long enough to really get into the details. You can check out abstracts and slides on the seminar website. After a full day of quite intensive discussion, there were breakout sessions during which four subgroups started working on the various chapters of a new Springer book that should appear sometime early in next year. The book will deal with multi-field, uncertainty, biomedical and scalable visualization, and it has the makings of being a keeper. The other extremely important magic bit about this castle is the abundance of real coffee machines (ones that grind coffee beans for every cup), snack corners and, uhm, beer fridges. You can’t really go anywhere, as you’re in the middle of nowhere, so after dinner the conversations tend to continue till late in the night, conversant stamina enhanced by said coffee and beer facilities. Evil science plans were made, good old-fashioned deep conversations were had and the early next morning consequences were flatly ignored. I haven’t laughed quite so much in a long time, but that part of the programme prefers, and has the right, to remain completely silent. If you ever get the invitation, don’t hesitate for a second to accept: You shall return an exhausted but terribly happy computer nerd.